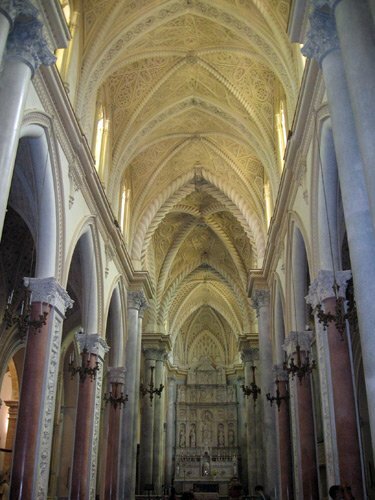 Sicily Small Group Tour 12 days with Amber Road » Our 17th year! 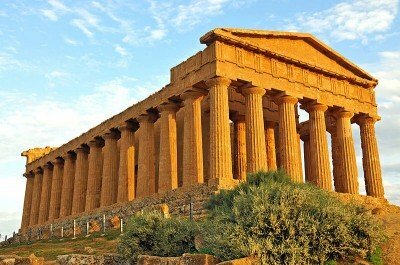 Sicily, the crossroads of the Mediterranean, is a mosaic of cultures east and west. We’ll discover Phoenicians at Mozia. Greeks at the Valley of Temples in Agrigento. Romans at Piazza Armerina’s 3rd century Villa del Casale. Norman kings and Arab/Byzantine influence at the Cappella Palatina Palermo and the cathedral and cloister at Monreale. Aristocratic palaces at Ragusa. 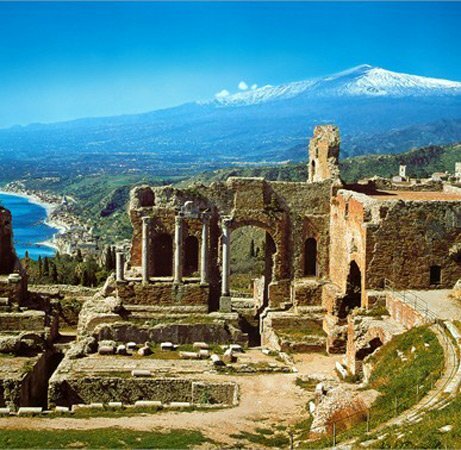 Along the way we’ll visit a salt museum at Marsala, view an historic puppet show performance at ancient Siracusa, take a cable car ride up magnificent Mt Etna, stay 3 nights in sparkling Taormina, have a taste of Etna’s wines and experience exquisite southern cuisine. 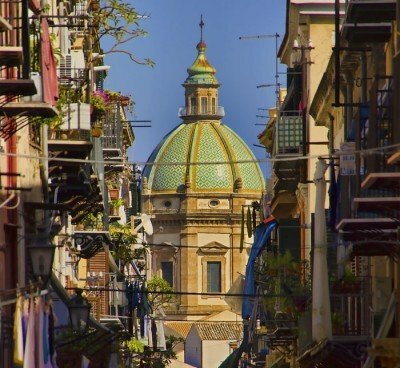 There are many ways to do Sicily but don’t miss Marsala on the islands’ west coast and evenings in Ragusa, two of our favorite towns. Arrival at Palermo International airport from where you will be transferred to the Centrale Palace Hotel located in the heart of Palermo’s historic district. Your tour manager will await you at 6:30pm at the hotel bar for the welcome meeting and aperitifs. 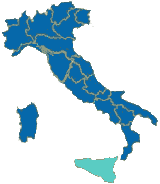 Sicilian cuisine, due to its unique history and mix of peoples, is distinctly different from that of any other Italian region. This evening we’ll begin your introduction with an included dinner of typical food and wines at a rooftop ristorante. The history of Sicily is woven from a rich 3,000 year old fabric populated by Phoenicians, Greeks, Romans, Byzantines, Arabs, Normans, Germans, French, Spanish and Italians. 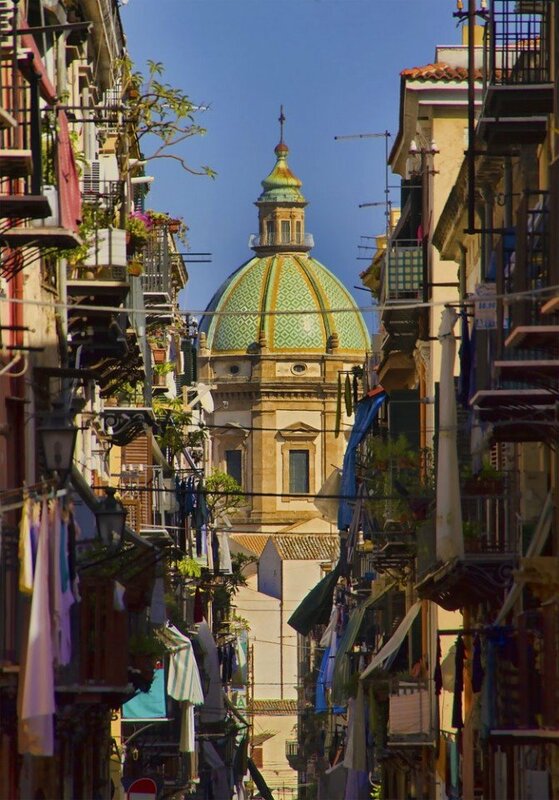 Palermo, the capital of the island, has one of the largest historic centers in Europe with over 500 palaces, churches, monasteries, theaters and gardens – truly an architectural feast. 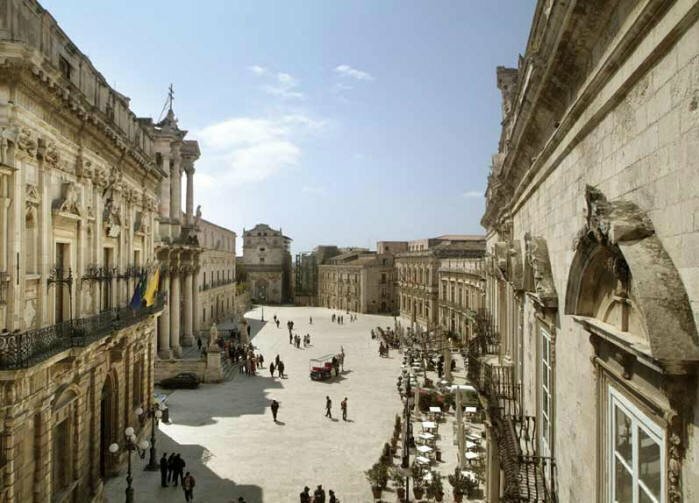 Today our local guide will introduce us to this marvelous city with an Arab – Norman tour that includes visits to the 9th century Palazzo Reale, with its splendid Palatine Chapel; and the Mercato Ballarò, the most popular outdoor food market in town with every kind of regional delicacy. Included lunch at the best typical tavern in Palermo. An afternoon trip up into the hills to Monreale, a lovely, small city best known for its splendid 12th century cathedral with a blend of Arab-Byzantine-Norman artistic styles and one of the world’s largest and most beautiful displays of mosaic artwork. Evening on your own in Palermo. Morning guided tour of the fabulous Greek temple at Segesta. 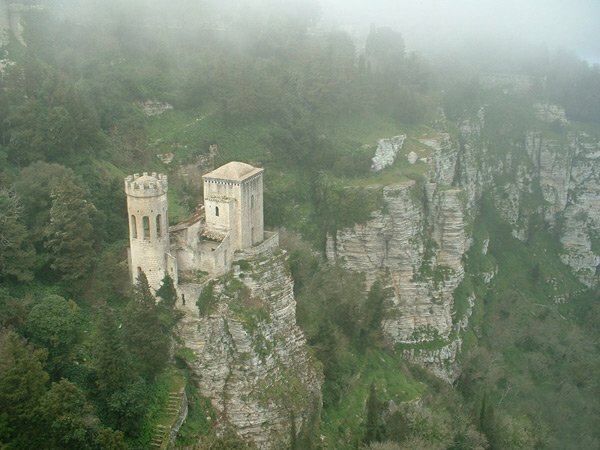 Then, a visit to the ancient hilltop town of Erice, once home to a people known as the Elimi, conquered in turn by Phoenicians, Carthaginians, Romans and then some. 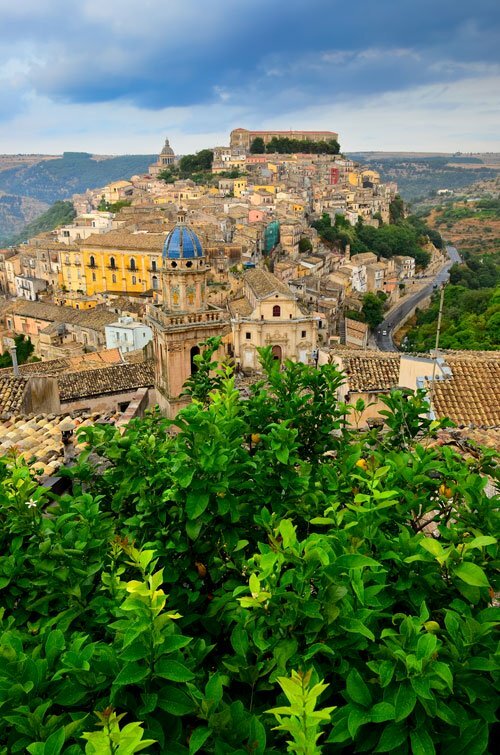 Today, it has a charming medieval appearance with cobblestone streets and spectacular castles – perhaps the loveliest village in all Sicily. After lunch we’ll descend to sea level via cable car to the west coast town of Trapani and proceed to Marsala where we’ll be staying for two nights at the Hotel Stella d’Italia or the Hotel Carmine. In 397 B.C. the Phoenician island colony of Mozia was destroyed by the tyrant Dionysius I of Syracuse. Fleeing refugees created a new city they called Lylibeo the city that faces Lybia. Conquered by Romans during the first Punic war, it reached its greatest splendor under Saracen rule (8th–11th centuries) under the name Marsà Allah port of Allah. On May 11, 1860 Giuseppe Garibaldi landed his 1000 troops at Marsala, the beginning of the unification of Italy (grazie mille!). 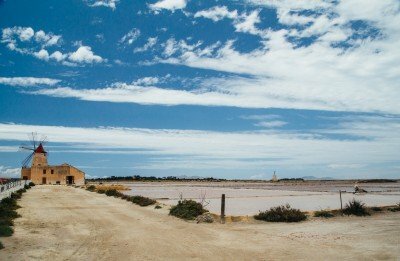 Marsala is famous for its salt pans and the production of Marsala wine. Today it is a port city with a delightful medieval town center. A visit to the excellent Museo Archeologico Baglio Anselmi, where we’ll find a reconstructed Punic warship whose hull dates back to the Roman victory over the Carthaginians in 241 B.C. 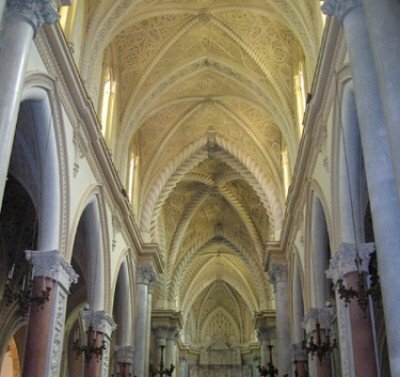 Our guided tour will continue into the historic district of Marsala after which you’ll have time on your own to visit the Museo degli Arazzi, a wonderful collection of Flemish tapestries from 1500 depicting scenes of the first Jewish-Roman War (66-70 A.D.). A short drive and ferry ride will take us to Isola San Pantaleo for a fascinating archeological tour. The ancient name of this city/island was Motya, a powerful military and trading center founded by Phoenicians that thrived from the 8th to the 5th centuries BC. 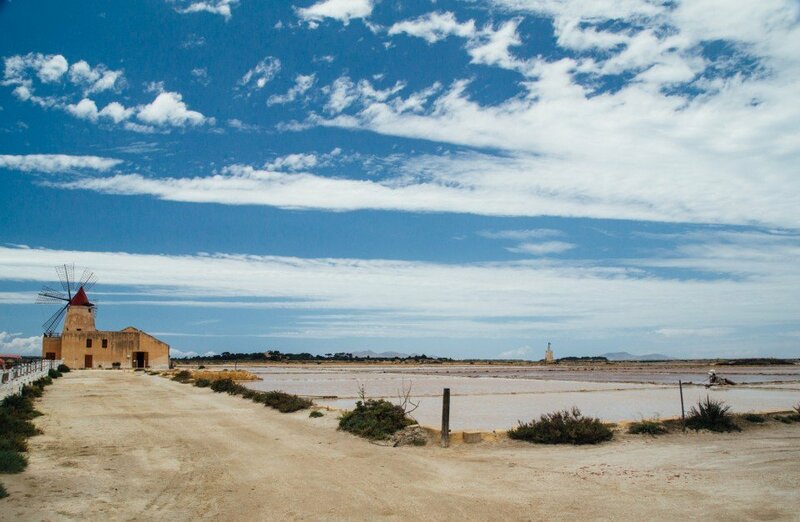 Visit to a salt works and the Museo del Sale. 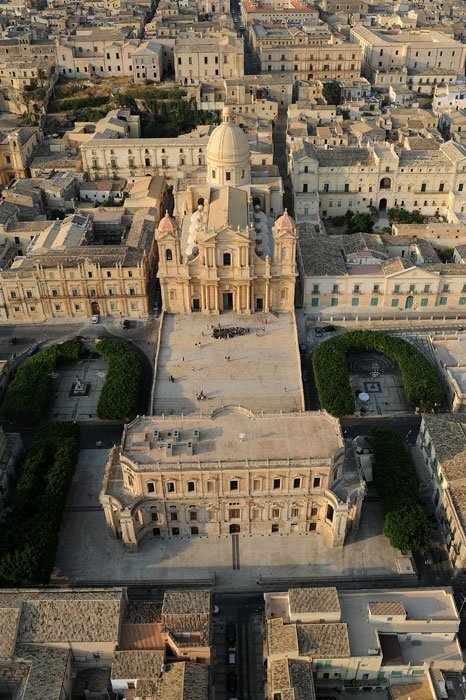 Afternoon transfer to Ragusa Ibla, for a two night stay at the Hotel Il Barocco. Included dinner of local flavors at a nearby restaurant, located in a 17th century palace. 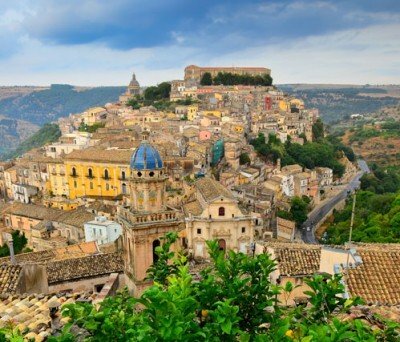 One of the most charming and picturesque hill towns in Sicily, Ragusa is divided into two parts – the ancient Ragusa Ibla with its labyrinth of crooked lanes, tiny squares and noble palazzos – and the slightly less old Ragusa Superiore. Mid morning tour with local guide followed by a tasting of local products. Afternoon visits to the gardens of Palazzo Bertini, the Teatro Donnafugata and to the Palazzo Arezzo di Trifiletti, a stunning aristocratic palace inhabited by the same family for over 200 years. 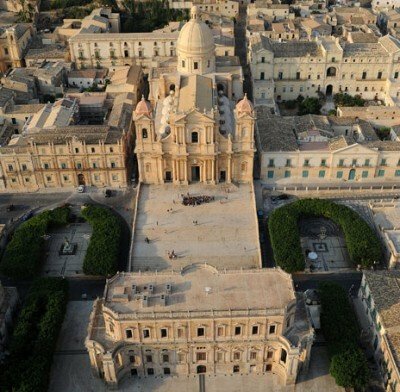 Morning guided tour of Noto, the magical Baroque city par excellence with its sandstone architecture, wide avenues and beautiful squares. Transfer to Syracuse, the once thriving metropolis of ancient Magna Graecia. You’ll be staying at the 19th century Antico Hotel Roma 1880 in the heart of Ortygia Island (two nights). This afternoon you can take the lovely island perimeter walk, see the Greek Temple of Apollo, visit the 13th century Norman Castle, or simply wander winding streets and alleys. Morning guided walking tour through the Neapolis Archaeological Zone for a visit to the impressive 16,000 seat Greek Theater, the Ear of Dionysius (a huge cavern) and the 3rd century AD Roman amphitheater. 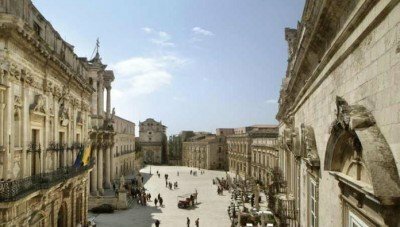 Afterwards we’ll explore the historic center of Syracuse, with its baroque palaces, narrow lanes, Greek ruins and the magnificent Piazza Duomo with the columns of the 5th century BC Temple of Athena still to be seen inside its cathedral. Late afternoon visit to the Teatro dei Pupi for a very entertaining experience of the traditional Sicilian art of puppet theater. Included in the UNESCO list as a masterpiece of the oral and intangible heritage of humanity. Evening on your own in Syracuse. 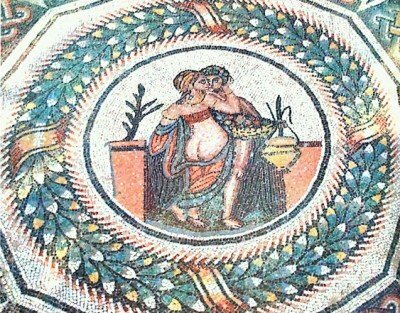 A guided visit to the Villa Romana del Casale at Piazza Armerina. The villa, constructed in the late 3rd century AD, was buried in a landslide during medieval times and only rediscovered in 1950. 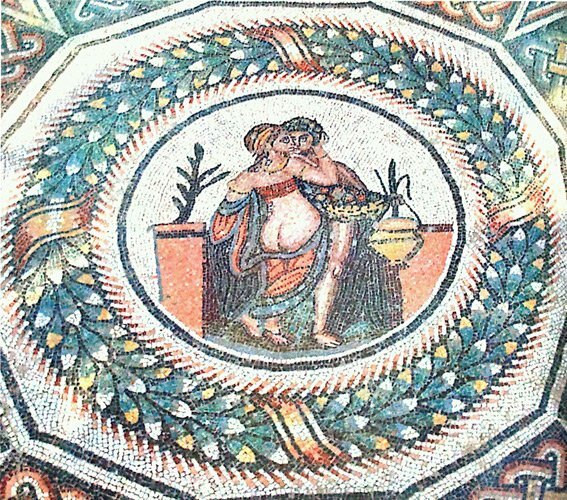 It contains the most splendid Roman mosaics still in existence, forty in all, covering 38,000 square feet. Included lunch at an excellent nearby trattoria. Late afternoon arrival to the famous hilltop town of Taormina, where we’ll be staying at the Hotel Villa Belvedere (three nights), a 19th century former noble residence overlooking terraced gardens of orange and lemon trees, the splendid Bay of Naxos and Mount Etna in the distance. Today we provide you with an adventure. Mount Etna, the biggest and most active of Europe’s volcanoes, rises majestically 11,000 feet above sea level, occasionally spewing forth flame, smoke and lava – the last serious eruption being in 2003. 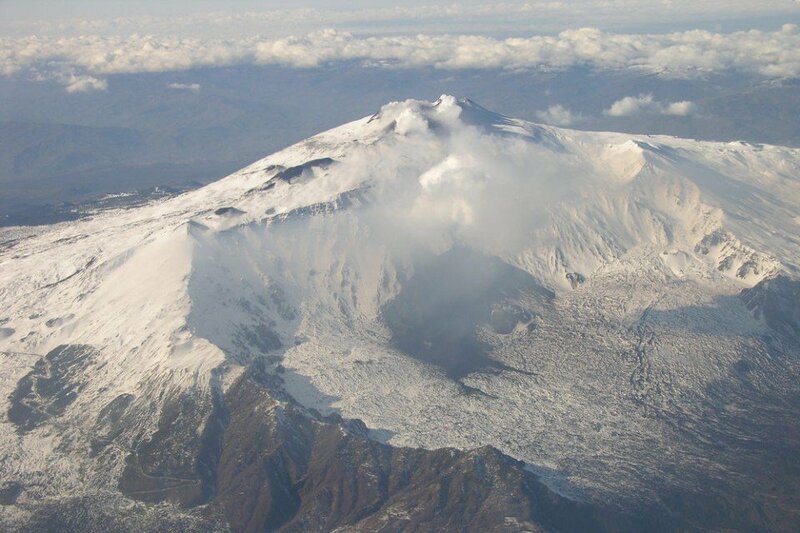 Our coach will take us up the side to the Sapienza Refuge, at a level of 6,266 ft, continuing by funivia (gondola) up to 8,200 feet where you’ll witness a vast lunar landscape with open volcanic cones. You can walk at leisure or take your adventure further with the option to proceed higher up on your own by funivia and then jeep. Afternoon tour of an Etna vineyard and cantina with wine tasting. Taormina, once a rich, ancient Greek town of 12,000 inhabitants, lies up on a 300 meter high rocky promontory overlooking the Ionian Sea. Picturesque and lively, a medieval aspect amidst bougainvillea and groves of lemons and oranges, it offers bustling cafes and boutiques as well as a deep immersion in art and archaeology surrounded by a spectacular landscape that seems almost unreal. 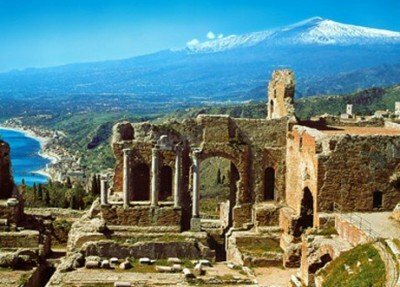 The Greek theater, the second largest in Sicily and with Etna as its spectacular backdrop, will be the first stop on our guided tour. Then we’ll enter the long pedestrian Corso Umberto and the rest of the day will unfold by itself. Afternoon free. Farewell dinner at a favorite local restaurant. Pre tour: We recommend arriving a day or more prior to tour start. You will be met by our driver at the airport and transferred to the first hotel on tour. Most of the walking on this tour is not difficult. However, be prepared to spend a few hours a day on your feet and expect some of your walking to be uphill. Age is not important as long as you are reasonably fit and a good walker. Our tours are not suited for anyone who has problems with knee, back, heart or obesity. If you have mobility issues this is not the right tour for you. Please call us if you have questions. Deposits and balance payments are accepted by Visa, Master Card, AMEX or by bank wire. After your deposit has been accredited we will send you an invoice with the due date and amount for the balance of payment. Should you fail to make final payment by the date specified on your invoice, we reserve the right to cancel your booking without refund. Transfers from Palermo “Falcone Borsellino” Airport on Day 1 (available only at scheduled time). All ground transportation Days 2 to 11, including tour manager and drivers. Transfers on Day 12 from Taormina to Catania airport. 11 nights’ hotel accommodations with breakfast. Included meals listed on itinerary including beverages (wine or beer or soft drinks and water). Admissions to all sites visited as a group, as listed in the Highlights of the tour itinerary. Air transportation, departure transfers after noon on Day 12, all meals not listed above, room service, phone calls, etc. Transfers available from Palermo airport at scheduled times. Our driver will be waiting for you just outside the arrivals terminal with an Amber Road Tours’ sign. Our last hotel destination in Taormina is located 50 minutes from the Catania airport. Day 12 transfers are available at scheduled times between 4am and 4pm. Most of the walking on this tour is not difficult. However, be prepared to spend a few hours a day on your feet and expect some of your walking to be uphill. Age is not important as long as you are reasonably fit and a good walker. Our tours are not suited for anyone who has problems with knee, back, heart or obesity. By air conditioned Mercedes 40 seat coach. Are located in quiet locations within historic districts or a short distance outside the city walls. European hotel rooms are generally smaller than those in the U.S., and have one queen bed or two single beds, with private bath. Historic district hotels are located in residences from earlier centuries and don’t have standardized rooms – each one is different. Taormina hotels allocate a mix of rooms of varying size and views. We have space available for one or two singles on each of our tours. They are provided with single-use double rooms. The additional single supplement cost is 500 euros. Please contact us for availability prior to booking.